If you listen to the podcast then you probably are aware that I’m a fan of flat faced triggers in my glocks. You also are probably aware that I think the stock gen5 triggers are much better than previous generations of Glock triggers. So much so that I had no intention of replacing my oem trigger in my gen5 Glock 19. Then Fowler industries sent me their zero trigger. 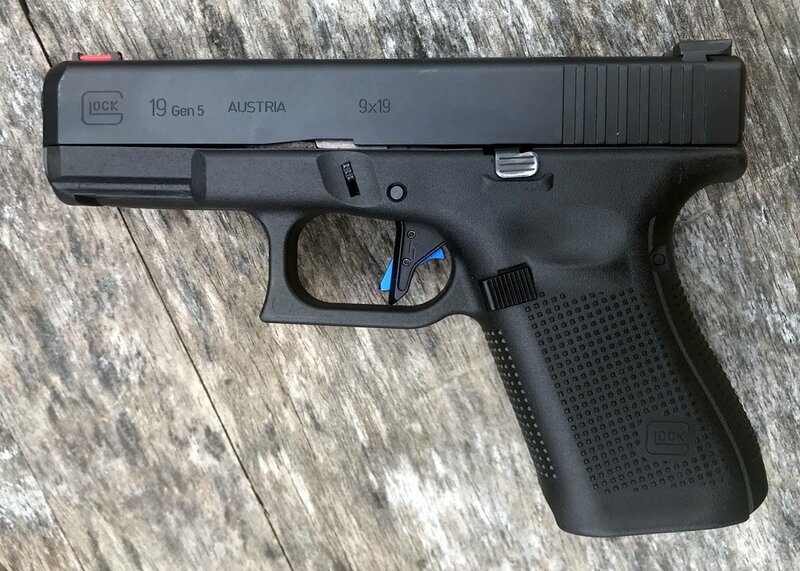 With low expectations and little enthusiasm I installed the trigger in my g19, as I’m the only reviewer with a gen5 glock apparently. I was pleasantly surprised. Installation was simple, like all Glock drop in triggers, and took just a few seconds to get it in there. The first thing I did was check that the trigger didn’t compromise safety. After checking the ledge and cruciform engagement (technical terms?) everything appeared to be good so I dropped it and hammered it a few times to see if I could get the trigger to trip. I could not. So it passed test one. Next up is feel, the trigger feels great and as a fan of flat faces triggers I really like this one. The sides are cut at angels so the trigger feels rounded and is comfortable for a variety of finger placements. Despite popular belief there isn’t a single spot everyone should place their finger on the trigger. While all flat faced triggers work fine when using the pad of your finger, they can be less comfortable with less or more finger on the trigger. Depending on your hand size and reach this could be important. While it’s hard to convey over text it really feels good. On to the trigger pull. The trigger is just slightly more smooth than the oem trigger. This is to be expected since they use an oem trigger bar that’s been polished. They recommend using an oem -connector and stock all other parts and springs. I ran the trigger with a few different connectors and I always (like all my other triggers) come back to the stock 5.5lbs connector. You could get the same smoothness but putting several thousands rounds through the gun but you’d still have a plastic curved shoe. If you want a 1911 like trigger, this isn’t the trigger for you but none of the drop safe options I’ve tried are either. If your looking for an better feel on the trigger, this might be it. Smooths out the trigger travel. Removes unnecessary take up or pre travel without compromising safety.